The Class of 2011 wait to receive their rings. This is the time of the summer when I begin to get private messages from parents with cadets at The Citadel. The new parents have questions about getting ready for Matriculation Day, the day the new cadets report. The parents of rising seniors are preparing for Parents Weekend, which is also referred to as Ring Weekend, the day the qualified seniors receive their class ring. Looking back on the four years my son was a cadet I can understand why there are so many questions about these two events. The school does a great job of posting helpful information, but there are times when a mother just wants to get the opinion of someone who has gone through the experience. Right now the Facebook group for 2017 parents is growing daily with new parents. It is a great place to ask questions of parents of graduates and to meet other new parents. My mantra with all parents is to remember there is no one right way to do things at The Citadel. Each cadet will have their own goals and possess their own gifts and talents. A general rule of thumb is to talk to your cadet about their preferences before you resource with others. That is especially true about preparing for knob year. If you wonder whether to purchase a certain item, ask your cadet if they want it first. A recent thread on a Facebook group grew to over 30 comments when a parent asked about bringing printers. Ultimately it is a personal preference. If you ask five different people their opinion, you will hear five different answers. My son invited a good friend to join us as we went through the ring. Most of the questions from parents of seniors this summer deal with what a mom should wear to the Ring Ceremony Friday night. Some traditional rules about attire for Ring Weekend are now more flexible in practice. Traditionally in any social context you dress for the occasion based on the uniform of the day. For seniors this means their full dress grey uniform, their most formal. They wear this uniform to receive their rings and to walk through the Ring during the ceremony Friday night. SO to follow the traditional rules of etiquette, the mom and or date should wear a formal outfit. That said you will see all types of outfits on the attendees at both events. Our family opted to wear nice “Sunday” attire Friday afternoon. For the Friday night Ring Ceremony I wore a formal gown. My 11-year-old daughter wore a nice dress and my husband was in a suit and tie. Scroll to the bottom of this entry to see a variety of dresses we saw in 2010. 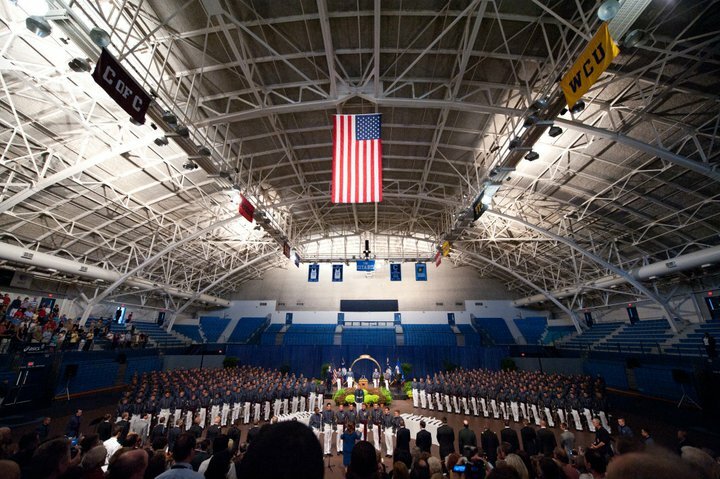 The Cadet Activities office handles the schedule for the weekend, including the schedule of when each company goes through the Ring. Be sure to check their website and the school website for the schedule. When your cadet’s company goes through the ring will dictate when you plan to have dinner that night. Many companies, or groups of friends, get together for a group dinner that evening. Not everyone does, however. Another example of when you need to coordinate with your cadet. Moms, as you are selecting shoes to wear be aware that you may have to wait in a long line to walk through the ring. It is really an opportunity to have your photo taken as you walk through the giant replica of the ring. After you walk through the ring you can go to the Ring Hop, or take a carriage ride through the campus. Bravo Company Class of 2014 prepare to receive their company letter. October 4 this year they will wear the ring. For the first year knobs, Friday afternoon and evening is a time to relax with their family and friends. Knobs and their families do not attend the Ring Hop Friday night. I was told by a TAC officer in 1st battalion that they prefer the knobs to get out of the barracks and off campus while the seniors are receiving their rings. The school will publish a schedule which will include an academic open house Friday afternoon and usually an update from the president. Knobs will have to have their rooms in order for the early morning open barracks, so they try to get back to the barracks before the Midnight curfew. Saturday morning the barracks will be open to guests. They usually have coffee and donuts in Mark Clark Hall along with an opportunity to purchase photos and other items from various vendors. At about 10:00 each company conducts their promotion ceremony for knobs. They are promoted from cadet recruits to cadet privates at the ceremony. The parade follows the ceremony and is before lunchtime. After the parade families get together for lunch with their cadets either in the mess hall or they bring a picnic or purchase a boxed lunch through the school. The cadets have to march to the football game together. They also have to sit together in the stands. It is fun to go to the game, then see the Summerall Guards perform at half-time. Many families enjoy tailgate parties outside the stadium before, during, and after the game. I’ll include links here to previous posts about the weekend. Bravo Company Cadre and knobs do a set of push ups at the end of the ceremony. Bravo cadet officers lead the push ups for the CLass of 2014 promotion ceremony. You will see all types of outfits on the moms during the Ring Ceremony. These are a few examples. You will also see other family members in addition to Moms going through with their cadet. Our family outside 1st Battalion after the ring presentation.